My first GWS warbird build, and by far the hardest. Room for the motor is quite limited, and the plane tends toward tail-heaviness. The wing is undercambered. It's basically all wrong, but my wife likes Spitfires, so why start with something easy? I filled in the undercamber with layers of balsa, then lightweight spackle. This worked out better than I hoped. I hogged out the front end and made a battery case for a short 83mm Commonsense 2000 MAH 3s battery, which moves the weight forward. The internals (servos, etc) were all moved forward also. In the end, the balance worked out. The oversize yellow wingtip is simply because it's hard to get orientation in the air. The camo works great! Main servo is a GWS Naro HP/BB. Tailfeathers use a brace of Picos. Motor is a Komodo 283v2 @ 7 turns of 20awg cranking an APC 7x6sf prop. Canopy was tinted with Pactra spray, which is very hard to do. Thunderbird 18 ESC. Finish is accomplished by sanding, then coating with water-based varathane, then using cheapo spray paint. This plane flies very well. Rolls are the most axial of the warbirds I've tried, and it can take all the speed you can throw at it. 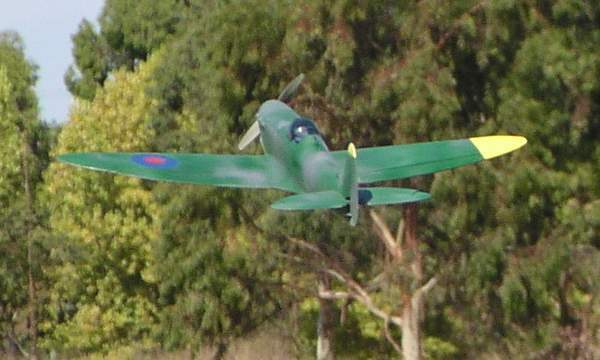 Aerobatics are reaosnable, but it's heavily coupled in knife, pulling hard toward the bottom. It does tip out fairly easily, and does not recover well at all. So anything really weird has to be done fairly high. 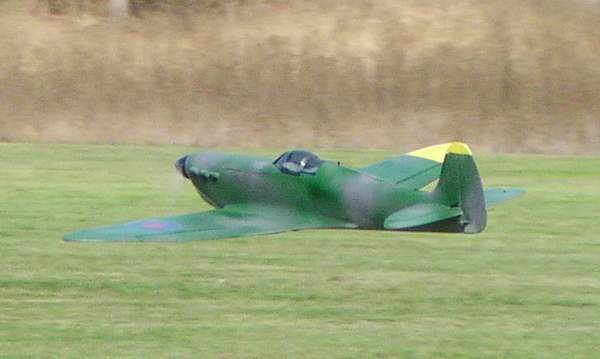 On the other hand, it's extraordinarily stable in ground effect and can do great low passes. Very little down needed inverted. 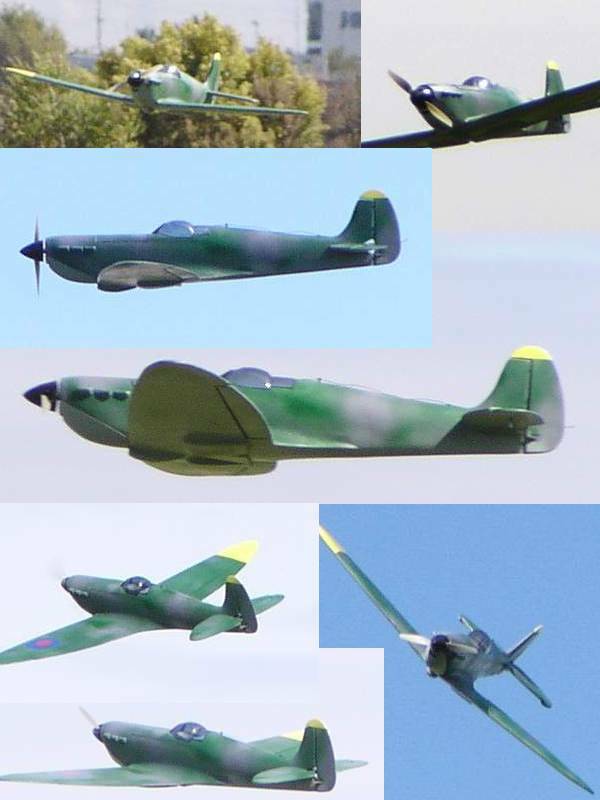 For a plane like this, the looks are almost as important as the flight characteristics. It's a weird rush to do a fast flyby with this Spit.